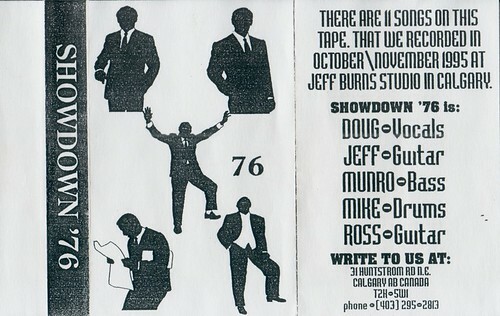 Alright, here we have the second self-titled tape from Showdown '76. Not only is this self-titled, but the 11 songs on here... don't have titles. Just straight numbers. We'll point your attention to the curiosities that are the last two tracks: track 10 is a cover of "Pride" (from their first tape) by one of the guys from Why? And the 11th track is just what it sounds like: a French Canadian doing karaoke to "I Love Rock and Roll." We're not sure what Doug Wurzer went on to after this, and we've talked about Bressanutti a few times (we saw his Sharp Ends the other week, at the Legion, and it was awe-inspiring) - Jeff Caissie went onto further shenanigans with Porter Hall (who he's recently reformed - you should go see them. So should we, for that matter) and the Browns. This is the one i've been hoping and wishing would get posted! One of the best bands to come out of Calgary. Really brings back some memories. Amazing I listened to this the other day when i dug out my old cassettes. I think this might be one of my favorite Calgary releases of all time! Hey, Mike - if you have more old Calgary tapes kicking around, and don't mind lending them out for a bit, we'd love to have at 'em. We digitize so you don't have to! I'll see if I can dig up anything worth putting on here. As of now the only stuff that survived me moving out of my parents are a few of my friends bands with so-so recordings and the showdown tape. But I'll take another look next time im around. I think I might have the consumer identity tape kicking around.